Well, July 18 is here. And you know what that means: only 28 more days until National Bratwurst Day. Also, it's the first day of the Republican National Convention. And to celebrate Cleveland's huge political extravaganza, longtime troll and now host of The Late Show with Stephen Colbert..., uh, Stephen Colbert, did what he does best: troll politicians. 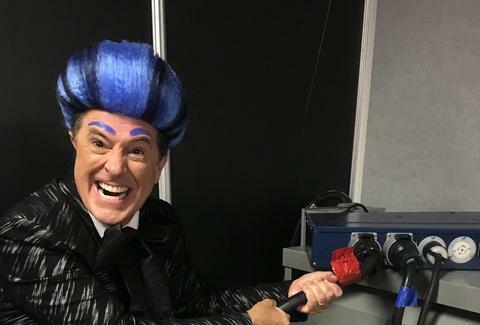 Colbert dressed in the guise of Caesar Flickerman, the host of The Hunger Games. In his over-the-top garb, Colbert stepped up to the main stage's podium, announcing the alliance between presumptive Republican presidential nominee Donald Trump and Indiana Governor Mike Pence, much as Stanley Tucci would in the Hunger Games. And fortunately, it was all caught on video. Unfortunately, said video is vertical and not great quality. Them's the breaks. Colbert's on-stage act lasted under a minute before he was escorted off the stage by security. But in all likelihood, the stunt was planned -- seeing how Colbert's doing a series of live shows at the RNC this week, which will also feature former Daily Show host, Jon Stewart. Even someone as daring as Colbert wouldn't risk pulling a Borat-esque prank that'd get him booted from the convention. Additionally, this is not the first time Colbert's dressed up and performed in this character, talking about The Hungry for Power Games. Still, it made for a funny scene. And the Late Show broadcasts this week already seem promising. Ryan Craggs is Thrillist's Senior News Editor. He's from Cleveland and anticipates this week being a complete mess. Follow him @ryanrcraggs.